Keeping fuzz free is one of those laborious tasks that everyone hates. Whether you shave, wax, use hair removal cream or do something more drastic, like dabbling with lasers, hair removal is always a chore. So, whenever something new hits the market, claiming to make the job easier, minus the pain and hassle, I'm always interested, especially as Summer is creeping ever nearer. Enter, Inhibitif. Not being a depilatory, rather than actually remove hair, this works to make hair significantly finer, slowing down the growth rate and reducing the density of hairs that do grow. Eventually, the need for shaving or waxing is less frequent and the process of hair removal is less time consuming and much more of a walk in the park. Inhibitif suggests that you use this spray religiously, twice a day, for two months, to see the best effects. Then use can be reduced to three times a week, to maintain those (hopefully) silkier, smoother results. Both morning and night, you're meant to spritz this onto shaved/waxed areas that you wish to rid of hair, making sure that the area is covered evenly. When I got this home and realised that this was the case, I was slightly disheartened, as it seemed like more of a pain than my usual routine. However, the application literally takes seconds, as it's a spray. Plus, I always moisturise my body before bed, so I just use this on my legs, in place of my beloved body butter. Once on the skin, it does feel a little tacky, taking a while to fully dry, before you can get dressed. So, if you're rushed in the mornings and don't have much time, this may not be for you. The formula is very liquid and the yellow colour is unfortunate, but it smells fresh and minty on application. Unfortunately, I have noticed that the fragrance does linger throughout wear, especially is the areas aren't covered up. Although, it is subtle and it's nothing that your favourite fragrance won't hide! Described as a serum, the watery consistency doesn't match up to thicker formulas that I usually associate with serums, but it allows the product to spread quickly and sink in well. The triple action formula creates a three-pronged attack on body hair, using the highest concentration of active ingredients, compared to similar products on the market. No parabens, propylene glycol, urea-based derivatives or oil are used. The inclusion of aloe, means that there's a slight tingle on the skin, which is cooling and refreshing for the warmer months. Just make sure you wash your hands thoroughly, after application! Priced at just under £30 for 240ml, this is on the expensive side. However, saying that, it will take a very long time to get through a whole bottle and considering the use of it decreases as time goes on, it may work out as a very cost effective measure. The bottle isn't at all fancy, but I doubt that anyone would be proudly displaying a hair removal product on their dressing table anyhow. The product doesn't come with much information within the packaging, other than basic instructions and very little about how it actually works, but the Inhibitif website is much more informative, if you want to read up on it some more. Of course, with all products like this, it takes weeks for the benefits to show. 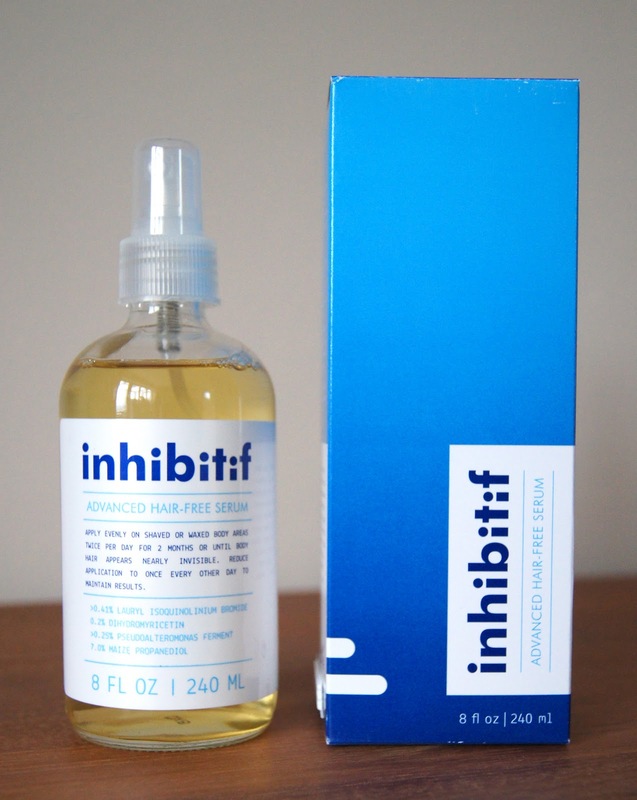 I've only been using Inhibitif for about a week, so I need to give it a proper trial to really let you lot know whether, a) it works b) I like it and c) whether it's worth a purchase or not. I'm going to do fortnightly updates, telling you about any progress, or lack of, that I've noticed. Do you ever fall for products like this? Do you think it will be a disappointment or do you have high hopes for Inhibitif?